Hello all! It's been a while since I've offered my opinion about a book I've read. I just have to say that I'm blown away by the novel, Glass by Ellen Hopkins. As one of my resolutions for 2011, I said that I would read more YA novels. Through my two writing buddies Pam and Marquita and after reading a couple novels, I've come to the conclusion that many YA novels are just as good, and often times better than adult fiction. Glass is no exception. Glass is the sequel to Crank. The third book, Fallout was released late last year (I'm waiting until it comes out in paperback!). The main character, Kristina, takes us on a rollercoaster of emotions as we follow her on her journey with "the monster" a.k.a Methamphetamine. Kristina, an unreliable narrator, tells the reader that she has this alter ego, named Bree. Throughout the novel, there is an inner struggle between Kristina and Bree. Kristina is innocent and usually wants to do the right thing, but Bree is responsible for pushing Kristina into rebellion. 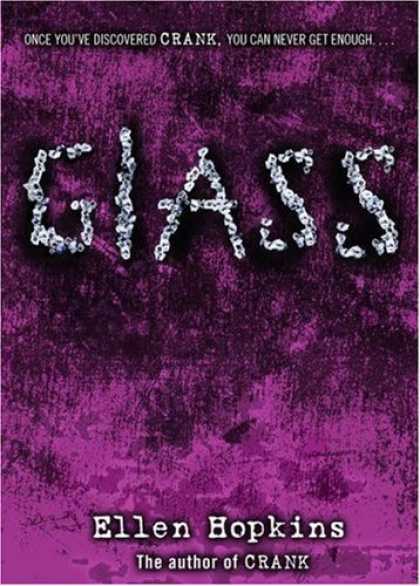 A very raw and real novel, Glass is the story about a young teenage mother and her struggle with a drug addiction. I don't want to give too much away, but I highly recommend this book to anyone. It seems like a long read (over 600 pages long) but the novel is written in unique poetic verses, so it goes by quickly. Glass took about five days because I had other things going on, but I read Crank in three. Ellen Hopkins is quite the gifted writer. I'm looking forward to reading Fallout and the rest of her novels. Hope you will too. So glad that you loved this book! It's one of my absolute faves, and I have The Fallout waiting on my shelf to be read. :) And thanks for the shout-out, sis!